This is a WIP that keeps threatening to turn into a UFO, but I am determined to finish it. All I have left is the backstitching, but there is a lot of it. When I have shown people this project, usually the first question is, “What is an Anhinga?” If you are from Florida or around the Gulf Coast of the U.S., you know an Anhinga is a bird! I purchased this pattern years ago at Three Crafty Ladies on Sanibel Is., Florida. The pattern is adapted from the artwork of Florida artist Ikki Matsumoto, who I have just learned passed away last year. You can still find some of the licensed cross-stitch designs on Etsy via RK Portfolio. This entry was posted in Cross-Stitch and Needlework, Personal and tagged cross stitch, cross-stitch, crossstitch, stitching, wip. Bookmark the permalink. 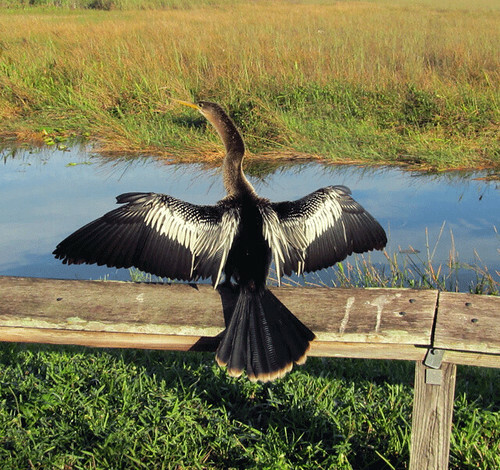 I lived in Louisiana for many years; I love anhingas. I miss them in the UK; we have some of their near relatives here, but they aren’t the same. I miss them, too. We don’t get them here in the Midwest either, although sometimes we see their cousins, like cormorants, during migrations. The are cormorants and shags (birds of many, many jokes) here; they’re similar superficially, but neither has that graceful, snakey neck, and while they do the spread-winged pose, neither seems to do it nearly as much. I had never heard of an Anhinga. What a beautiful bird! You should finish the stitching. It will make it even better. Great stitching. Don’t give up! Once the back stitching is done you’ll be so pleased with it!